For many listeners, Fred P. was one of 2009’s major discoveries. Less a young upstart than a veteran finally getting his due, Fred Peterkin has become one of the key players in New York City’s resurgent house scene. His affiliations with Jus-Ed and Move D — both of whom are contributors to upcoming releases on Peterkin’s Soul People Music imprint — hint at his elegant deep house style, but his releases for the past two years as Black Jazz Consortium have established his unique voice. Fred took off from working on his ever-expanding label and his own productions not only for an in-depth discussion, but to provide us with our 29th podcast as well: an exclusive two hour journey through the deepest house — including some unreleased cuts. How was this mix recorded? You’ve put out tracks under both your own name and as Black Jazz Consortium. Is there a difference? Yeah, to a certain degree. The stuff I do as Black Jazz Consortium is a bit more consistent, as opposed to Fred P where I’m experimenting a little bit. If I’m compiling or something like that, outside of me being creative, I’ll probably just be Fred P. An exception would be the upcoming Earthtones collaboration on vinyl, which is myself, DJ Jus-Ed, and Move D. That’s probably the only compilation where I’ll be Black Jazz Consortium. How do you approach a collaboration like that? How did it come together? Well, I’ve been on Underground Quality on a few outings already, and I met Move D my first time in Germany. Basically, he knows my work and he likes my work, and I respect him a lot; I think he’s a great artist. The music I did with Move D I’ve had for a while, like a year. The original idea for the Earthones collaboration was to be a CD, but seeing what’s going on with technology now, what goes on with CDs when they come out, I feel it would be better to respect the work put into it musically by doing it on vinyl. Do you stick to vinyl as a DJ? Yes. I’d like to exclusively play with vinyl, though it’s kind of difficult. When I have some promotional stuff that’s on a CD, or something deep in my collection that’s on a CD, then whatever, but I like to play with vinyl. In a perfect world, it would be all vinyl. Where did the name Black Jazz Consortium come from? 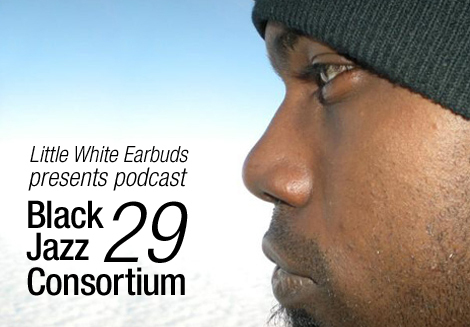 The name Black Jazz Consortium came from a project I did about 10 years ago. The original name of it was Brooklyn Jazz Consortium, because I was living in Brooklyn then — Bed-Stuy, to be exact. I told a good friend of mine by the name of Jay Locke about it and he was like, “Yeah, that’s a cool name,” but the project never went anywhere and it went into the closet for eons. 10 years later, I did a couple releases digitally, and I needed a name. I came across one of my CDs at the time that said Brooklyn Jazz Consortium, but I wasn’t living in Brooklyn anymore and it wouldn’t have made sense. So I just said, I need a quick name, and came up with Black Jazz Consortium. Slapped that on it, and off to the races. It seemed to catch on, and as time went by I started to define what that actually meant, and it took on a deeper meaning. What is that deeper meaning? 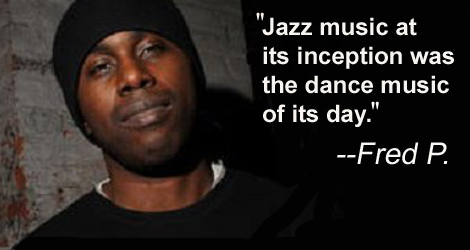 I love jazz music, basically the idea of it, because it’s so closely related to dance music. If you really look at it through the history, jazz music at its inception was the dance music of its day. Now it’s really no different, it’s just electronic, and it’s more about artists themselves as opposed to a trio or quartet or whatever the case may be. But to me, it’s free-form music. Name some jazz musicians who have inspired you. Chick Corea, Groove Holmes, Oscar Peterson, Stanley Turrentine, Freddie Hubbard, Tom Scott — there’s a whole bunch of ’em actually. Do you have any experience playing jazz, or any other kind of musical training? Nah, I play by ear. If the vibe is good, and I can feel it, I might be able to scratch out a little something. I’m not a traditional musician by any stretch of the imagination, so I couldn’t tell you a note if you asked me. I play both black and white keys though, it’s not like I only play black keys! How did you first get into making tracks? I started making tracks when I was like, 15 years old. What happened was, I was into hip-hop back then, beatboxing, cutting and scratching, breakdancing — you know, pseudo-b-boy stuff. Someone saw me rhyming with a friend from school and said, “Hey, I wanna make a demo.” I didn’t know the first thing about that, but I saw it as an opportunity. So I pretended I had some knowledge of what that was about. That was my first opportunity to see a studio, and once I got in the door, forget about it. It’s been on ever since. After that experience, I started to collect cassette decks, and tried to learn what multi-tracking was about. Even though the sound quality was terrible, it taught me the concept of sound design. Some of that stuff I still do in my tracks, with some of the weird noisier sounding things. “Levels” is a good example of that, you have the layered noises bouncing around within it as a rhythm. That’s a piece of that concept. What inspired you to move from hip-hop to electronic music? When I was in high school, I used to go to clubs to dance. I hung out in high school with a friend whose family members were actually in the scene and were able to get into clubs for free. It was always about dancing, I didn’t really have anything to do with collecting records or wanting to DJ. I just loved to dance to the music. That’s how I got into house. It was definitely about the vibe, the energy, the whole nine. I did that from about ’88 to about ’90 — three years’ worth of going to clubs and dancing, back before I even collected a record. Then when I stopped; I missed the music, so I would go to the record stores and buy the records. So even though I got into hip-hop and was doing hip-hop production and all this stuff, behind the scenes I was still listening to house music. It never really left; it was what I would listen to when I didn’t want to hear anything else. It was always there, and when I got my first studio set up, the first tracks I produced were house tracks. No one ever heard them, but I produced them. They came to me easier than hip-hop at the time. I actually had to learn to put a hip-hop track together, whereas a house track kind of came easily to me. Not to say it’s easy to do, but the idea, the form, was a bit easier to wrap my mind around. To make a long story short, when I stopped doing hip-hop I stopped creating music altogether for about two years. When I got back into it again, my good friend Jay Locke inspired me to get back into making electronic music. In the very beginning it was like Todd Terry, Masters At Work, anything that was on Strictly Rhythm, Nervous, Right Area — those were the main labels. That was in the early days. Fast forward, say to about 1999, 2000, it was basically Bugz in the Attic, 4Hero, IG Culture — the whole West London crew. They’re the ones who re-inspired me to really go hard and make some music, because they were using all the elements I liked from all electronic music, not just house or broken beat. They were utilizing everything and putting it into a danceable form, and that’s what made me really want to make music again. So I was collecting that stuff from about 1999 to about 2003, and then I switched. I started getting into deeper house, like real deep house, which is where the association with Underground Quality comes from, because Ed has been producing just some of the deepest stuff from then until now. He’s still bringing out some bangers — he’s the man for that! That’s really what I’m playing now, with little nuggets from other places, but it’s mainly Underground Quality, Strength Music, Novel Sound, Deconstruct. I mean, I’m not shirking anybody, that’s just what’s going on right now! Has the scene in New York changed much since you got involved with it? I have to be perfectly honest with you. I’m a bit of a hermit. I mean, when I used to go out way back in the day, the scene was different. New York was different. We didn’t have all the restrictions we’ve got now. Back in like, ’87, you could really party in New York from sunup to sundown and it really wouldn’t be any problem. Now the club scene is so constricted, it’s crazy. It’s difficult for underground guys to really get something started in the clubs because there’s so much on the back end you have to worry about, monetarily and logistically. So you don’t get to see much about that anymore. Especially since 9/11, it changed the scene a lot, because of the laws and all that different stuff. Today, to be real with you, I only come out to parties where I know I’m going to hear what I like to hear. But now music is being presented in different forms. For instance, House-n-Home is done in a loft as opposed to a club, which is genius because it takes the club aesthetic out and leaves the house party in. That place is incredible and every party I’ve attended has been a stellar event. That’s my reason for going out. Otherwise I might step out here or there but I’m not really out in the scene like that because that energy I like about the scene isn’t really there. I mean, don’t get me wrong, everybody’s doing stuff. I could talk about it more on a musical tip than about the scene. Musically, there’s a definite shift going on because really, this kind of stuff might have been there but it hasn’t been put on the forefront. All credit goes to DJ Jus-Ed for putting it on the forefront. For instance, that Unity Kolabo Ed set up, if you listen to that, everyone on it is absolutely amazing! And I’m not saying that because I’m on it. I haven’t seen a record like that in years. Musically, there’s definitely a paradigm shift happening in dance music in New York. Do you get to play in town much? Where do most of your gigs happen? What’s funny is that my first major gig was overseas. I played at Hafen 2 in Offenbach and Cube in Heidelberg a year ago or so, and those were the first major clubs I’ve ever played in. I couldn’t get arrested here, actually. Then I went back for an Underground Quality night in Berlin with DJ Jus-Ed and DJ Qu, and then when I came home I started to get more gigs. So I was gigging about every month for like six months or so. Which was cool, because I wasn’t exactly used to it. I’m more of a production guy. Ninety percent of the time I’m in the studio, and it’s different world getting out and performing with records. I’m still actually getting a feel for it. Is music a full-time thing for you? Yes it is. It is doesn’t pay as much as commercial music, not remotely. It’s only because of the economy, I mean jobs are tight now. But I definitely need another hustle to go along with this, because I’m truly independent, man. I gotta work it for what I can. Soul People Music has focused on putting out your own productions. Do you plan on adding other artists in the future? Soul People in the very beginning was digital, and there was a whole roster. There were eight or nine releases. Then we lost our digital distribution, which happens if you don’t release something like, every week, to keep up with quotas. Then I started producing vinyl, which is a difficult medium to build on since the record stores started closing. So I’ve been putting all my effort into the Black Jazz Consortium project, to build it up so I can start presenting other artists on vinyl. That way it’s not so much a roll of the dice. I’m starting to do it with the Earthtones project. Maybe three or four records into that series I can start bringing out some artists who I already have on the roster who have gotten released digitally. You’ll start to see more artists digitally, but in the future you’ll see them on vinyl as well. How has digital technology affected what you do, not only terms of distribution but production as well? The only piece of computer software I use is Cubase, and I use it for recording purposes only. I’m old school when it comes to making music. I need the equipment right in front of me. I need knobs. I need to be able to turn things on and off with my fingers, instead of a mouse. I need to slide things. So I use a keyboard, I use a sampler, and I use a board to make my thing happen. Nothing against digital studios, at some point I will have to get with the technology of the day and try it out. But what I know is analog, and that’s how I get down. The only problem I have with digital music is that if you have a lot of artists using the same program, most of the time a lot of their music tends to have the same feeling. You get a lot of the same sounds, so they basically all sound like the same song! With time, you can freak anything and make it a little bit different, but for me, I live in an analog world. There’s more feeling to it, and you can hear everything, right or wrong. Whereas with digital, it’s so clean. There’s no room for anything else! That’s cool too, and I do have some of that music. I don’t hate on it at all. But I like the analog environment. Does having those knobs and sliders affect how you produce tracks? How does your creative process work? I don’t know, man. That’s a touchy subject! I don’t particularly have a theory for making music. Maybe that is my theory. I really enjoy Mr. P’s production and this mix seems to be a winner as well. Thanks for the podcasts in general and this one in particular. This mix right here is what deep house is all about. Steve, you have outdone yourself this time. Absolutely unbelievable. 10/5. All credit is due to Shuja Haider. It’s a great interview and addition to the podcast series. Amazing, after listening to his mix, now I can understand his music even deeper. absolutely massive mix and a really wonderful read as well. i must confess i didn’t really know fred p’s work very well before this, but this makes me want to track down every single 12″ he’s involved with. well done shuja and fred p! fred ! well done on an excellent mix !!! not long before Tape berlin & Fabric London . This is a really smooth deep mix. Thanks for the thoughts on Jazz music, we need more people like this in house, people that stop drawing upon house itself but draw upon a richer MUSICAL history. I’m really tired of techno inspired by techno. Excellent! What a beautiful / creative mix. Really feels like a fully accomplished piece of work. i was trying to get Fred to hook us up at ISM wayyyy back in summer 98 but i guess he wasn’t down! anyway, it’s good to see this, big ups to Shuja for making it happen. DLing the mix now, can’t wait to listen. lots of my jams on the tracklist…. Very cool interview / mix. Only problem is going to be figuring out how to split this onto two CD’s for the car, haha. brilliant session, i absolutely loved this. cheers guys. Fave track > Black Jazz Consortium – The Om, see it soon on vinyl? Thanks for the mix and interview. Wow, I keep coming back to this mix, its the absolute bomb!! !